There is a right way and a wrong way to do almost everything and that certainly is true of the judging of black ducks. While this article is directed most particularly at two breeds in particular (the Cayuga and East Indie) which have reached a high degree of quality in terms of color, it will apply equally to any breed of black duck (Black Runner, Black Call, etc.) that has reached a point in its development when subtle color points will make a difference in placements in a given class. When judging either Cayugas or Indies, I strongly advise that the judge make two passes through the class in the evaluative process. The first pass is to establish the relative merit of each bird in terms of type, size and carriage and to spot any obvious major defects that might put the bird out of the running in that class. The cards of birds which do not merit any further consideration can be flipped up or treated in some other way that the judge knows that no further time need be spent evaluating them. The second pass requires that any birds still under consideration be handled. I am frankly amazed at the number of judges who skip this process. Cayugas and East Indies in close competition simply cannot be properly evaluated without being handled. There are too many defects that cannot be seen without such an examination. A common flaw in both breeds, for example, is white at the base of the jaw and at the throat where it meets the lower mandible. The presence of such white is clearly a significant defect to the judge in birds which are otherwise nearly equal, particularly if more than 1-2 white feathers are involved. The problem is that most such white cannot be spotted from the aisle. Another area where hidden white is often found is in the wings and body where (especially in older birds) part of a feather or all of one may have turned white. Defects of that nature normally cannot be seen unless the wings and body are examined. One frequent characteristic frequently seen in Cayugas that needs to be addressed here is that for as long back as I can remember, Cayugas have occasionally displayed obvious "stubs" on their legs. Stubs are feathers on the legs (or feet) which are not supposed to be there on a clean legged bird. Lets be clear, just because the Standard does not specifically forbid stubs on a Cayuga (or any other duck) does not mean that a judge should ignore them. A close reading of the "general disqualifications" section of the APA Standard should make that obvious. Most experienced judges will not place a Cayuga with feathers on it's legs. Furthermore, I cannot understand why the APA has not addressed the oversight in their Standard. Cayuga exhibitors should simply check their birds for stubs and remove them as do the exhibitors of many breeds of clean legged chickens. 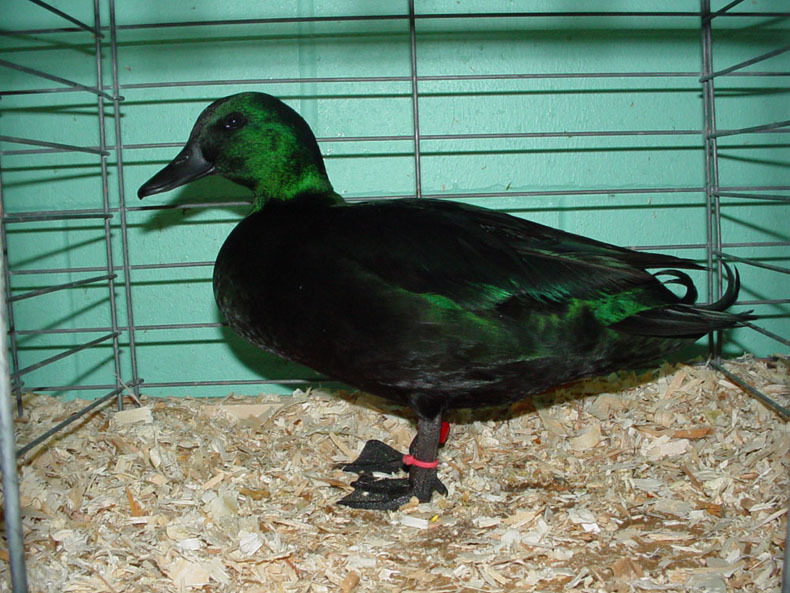 Another common color flaw frequently missed by those judges who choose not to handle black ducks is purple barring. That defect is usually related to extremes in heat during the summer months when the feathers are coming in. I believe that the birds lose their appetites when the heat is extreme and consequently the stream of nutrients to the developing feather is interrupted causing the damage. If the interruption is severe, the actual webbing on the feather will be damaged. If the interruption is less severe, a purple band may result or the entire feather may be purple when it should be green. Why am I sure that the problem is environmental and not genetic? If the problem were genetic, the feather would re-grow in the same condition if it were pulled. In fact, if the feather is pulled, it will re- grow without the defect, assuming that the bird's appetite has returned to normal and that feed containing the proper nutrition is available. But, I digress. The point I want to make is that purple in the plumage of a black bird is normally only obvious when viewed in good light, preferably natural light. It also may not be obvious from the aisle. If one does not take the time to handle at least the birds one intends to place, it is easy to miss something that may be obvious later to someone else. The bottom line is this: if one would not think of placing a Black Rosecomb highly without a thorough examination, why would one not think that the Indie in a neighboring cage deserves to be accorded the same time and consideration?